Pride & Prejudice is a good, old-fashioned movie. The star is a pretty young actress, photographed in the most flattering light possible. The story is good-hearted, romantic, and lacking in any sort of cynicism. Except for some more naturalistic acting styles and some impressive SteadiCam photography, it could almost have been made in parallel with Laurence Olivier’s version. Keira Knightley plays Elizabeth in this latest adaptation of Jane Austen’s novel. She and her four sisters live with their mother and father. Father has land and an income, but when he dies it will pass to their cousin, and the girls will be left homeless and penniless unless they can find husbands. An opening scene shows our girls listening at the parlor door to see what they can hear of the new neighbors. Apparently, one is an eligible bachelor, Mr. Bingley, who’s very rich. When he finally arrives, they discover another bachelor, Mr. Darcy, has accompanied him. There is a ball in honor of the new neighbors, and all the neighbors show up to dance and flirt. Elizabeth takes an immediate dislike to Mr. Darcy, who seems too smug and self-possessed by half. Meanwhile, Mr. Bingley seems to be smitten by her older sister. 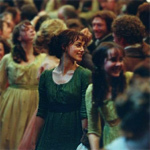 The new movie follows the old story faithfully, through the arrival of Mr. Wickham, who paints Mr. Darcy’s reputation black; the Bingleys’ unexpected departure; Liz’s visit to London; her encounters with Mr. Darcy; straight through to Austen’s triumphant and happy ending. Knightly is unquestionably the star of the movie, and she glows. She has that mysterious combination of personality, looks, and talent that add up to star power. She is supported by a wonderful cast in likeable roles. Brenda Blethyn (Saving Grace) is Elizabeth’s mother, and Donald Sutherland is her white-haired, kindly father. Together they give the movie weight and familiarity, and they make the girls seem all the more likeable for coming from their stock. Not only does director Joe Wright know how to showcase his cast, he unleashes cinematographer Roman Osin, who shoots several elaborately choreographed long camera moves (kudos to SteadiCam operator Simon Baker) through the crowded, costumed throngs of the country ball. It’s a bit of technical prowess that is both impressive and yet not overpoweringly showy. Then again, familiarity is not really a problem. If you missed the Olivier version on TCM, you might have seen the Bollywood remake (Bride & Prejudice) just a few years ago. Plus, there seems to have been a glut of Jane Austen movies in the last 15 years. If anything, audiences may have been Jane-Austened out. And in fact, those with Austenitis might fairly complain that the movie is a little self-indulgent, running for more than a full two hours and not cutting to the chase quickly enough. But Knightley and her co-stars make it easy to forgive Pride & Prejudice for any overload we might have suffered. It’s a winning, old-fashioned movie, a time machine that removes you from 2005 for two hours and tells you a satisfying story of love.